I have been meaning to write a post called "Transition" for a while, where I would primarily have talked about the new job I just started a few weeks ago, and that I am very excited about (more about this below). However, as I was finally ready to write about this yesterday, I realized that there is another transition going on in our family, this one affecting Daniel, and it's probably going to be more challenging, both for him and for me. As it turns out, back to school stress doesn't start at kindergarten or even pre-school level... Daniel's daycare, the Children's Pre-School Center (which includes both an infant daycare and a pre-school, and is great by the way - I talked about it here), also has their own fall class changes. This makes sense: as the oldest kids leave, spots open up in the pre-school classes for children to move up, and this then trickles down to the younger classes. The approach is to try to move as many children as possible at the same time in the fall, so that they stay together as they progress from class to class. The challenge is how to apply this in the toddler class, where Daniel is currently in. 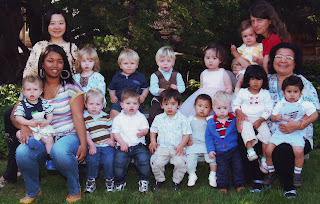 At the infant and toddler stage, it wouldn't make sense to batch all kids born in the same year in one group... A 13-month and a 23-month kid still have very little in common. So the transition to these classrooms is a lot more fluid, depending on development stages. As Daniel was an early walker, a decent communicator, and a good eater (he eats everything), he was able to move to the toddler class at 12 months already, back in January. He adapted very easily, and quickly made friends, especially with the kids that are 6-8 months older than him. By now, these friends are part of his life. Every morning, he runs happily to the door, ready to leave for daycare, calling out his friends' names. In the car on the way back, he tells me about his day with his friends (Granted, it's mostly babbling I don't understand, but I can recognize his friends' names in the sentences). When we were gone for a few days to Yellowstone, he asked for his friends a lot. He definitely has established strong bonds with them and misses them when he isn't around them. in the rare instances when I am not the last parent picking up Daniel, I can see these interactions with my own eyes. And yes, there is so much laughing, playing silly games, hugging. So cute at this age! The problem is that, because his friends are 6-8 months older, they belong to the cohort that is moving up to the next class as part of the fall transition. Daniel will be staying behind for a few more months at least. Objectively, this makes sense. Daniel isn't at the same development stage as his friends, from a language, fine motor skill and maturity standpoint. He isn't ready for pre-school yet, and this is OK. He is only 19-months after all. There has been a lot of communication about this transition over the last months, so we have had the time to think about it and prepare for it.... So I thought. Yesterday, we got the latest email, informing all parents of the immediate logistics of the transition, and I realized all of a sudden that this is happening NEXT WEEK! And I panicked! How am I going to explain to Daniel that most of his closest friends won't be here with him anymore? Just the thought of Daniel missing them all the time, the same way he missed them in Yellowstone for 5 days, is breaking my heart. I know kids are resilient, and that he will certainly make friends with the new toddlers that will join the class. Still, it will probably be the first time Daniel is faced with losing his good friends, right after working so hard on understanding the concept of friendship. I can't stand it... The transition doesn't only affect kids that are moving to a new classroom after all. It's definitely going to be a huge change for Daniel. Wondering who is going to have the most difficult time next week, Daniel, his friends or me? As for my job change, this is good news all around. At least, one easy transition.